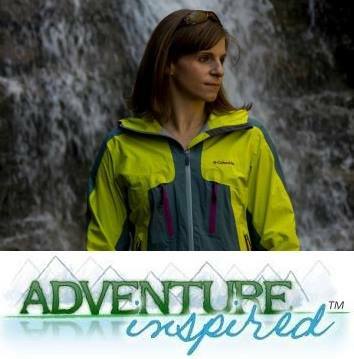 Writer, filmmaker, climber and guide Majka Burhardt is an inspiration. Some of us dream of traveling the world, exploring unclimbed cliffs, and getting to know foreign places. Majka has accomplished all of that and then some, capturing the hearts and minds of readers worldwide with her eye-opening writings and films. Majka's latest masterpiece could be the perfect coffee table centerpiece, but deserves much more than a place of prominence on a piece of furniture. Coffee Story: Ethiopia isn't a novel, a story, or a photo essay, but rather a collection of a variety of pieces, a quilt of sorts, meant to stimulate conversation about a commodity too often taken for granted and the beautiful country it originated from. If you drink coffee, you're connected to Ethiopia, and if you're connected to Ethiopia, you need to read this book. I was enthralled by the photos and stories from start to finish, eager to digest as much as I could about something I can't seem to start the day without. 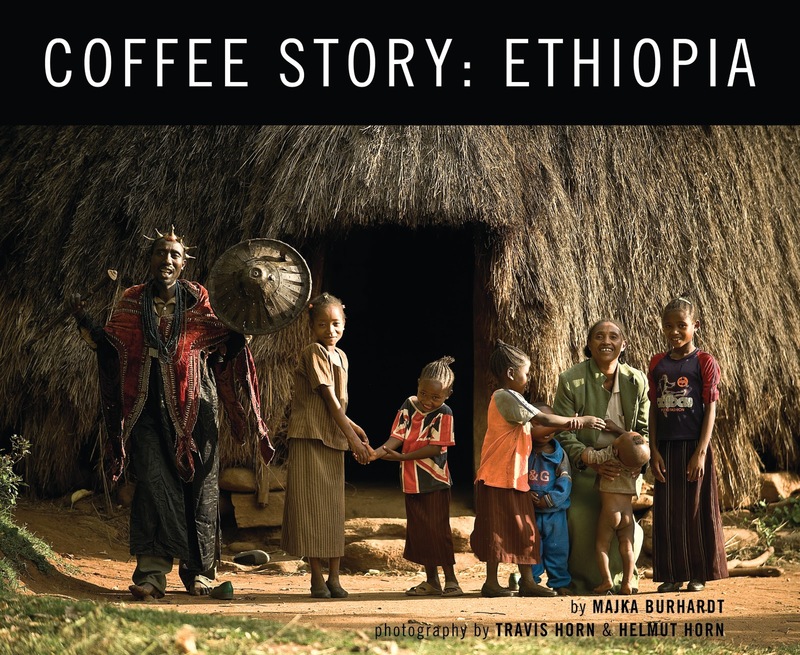 Majka's brilliant storytelling and stunning photos by Travis Horn and Helmut Horn bring history, culture, tradition and exploration together, illustrating how coffee impacts people across the world. We learn the story not just of what is one of the most valued commodities in the world, but of its producers, its history and its culture. 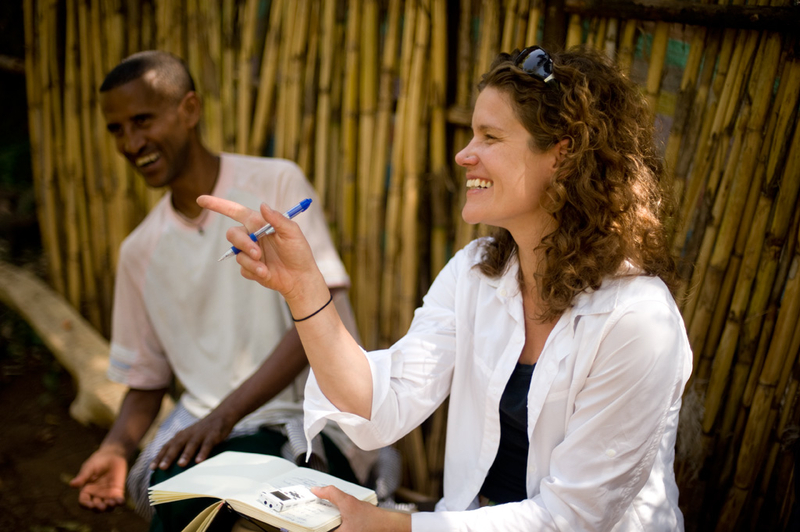 It's obvious the author is passionate about her craft, Ethiopia and Ethiopian people, and in this interview, we have the privilege of learning a little bit more about her. What first brought you to Ethiopia? A free latte. Seriously-- true story. That latte lead to a trip to try and find the genetic roots of a coffee that garners $150/lb on the world market in Ethiopia, the country that is the birthplace of Coffee Arabica. I was a journalist on that trip and while we didn't find the coffee, I found Ethiopia. This was in 2006. I ended up spending the next three and a half months in Ethiopia and eventually going on an expedition to establish first ascents on what turned out to be very soft and very crumbly sandstone spires. And then I wrote a book (Vertical Ethiopia) about how to understand soft rock, immense opportunity for adventure, and the possibility and reality of Ethiopia in the current age. Tell us a little about your other projects, Waypoint Namibia and Vertical Ethiopia. Waypoint Namibia is a film about the deepening conversation between adventure and culture, and if climbing could be a way to connect the two. Kate Rutherford and Peter Doucette were my expedition partners, and I was also fortunate to get to work with some of the best visual creators out there - Chris Alstrin and Gabe Rogel. Vertical Ethiopia is an adventure chronicle, and the first step toward Coffee Story: Ethiopia. Both Waypoint Namibia and Vertical Ethiopia resulted in speaking tours throughout North America and it's during those events that I’m able to gain a full understanding of how the projects I’m doing can create greater dialog in the world. Do you consider yourself a climber first, an author, or something else entirely? Depends on the day. On any given week, I try to be both. A few years ago, I accepted that my passions take me in multiple directions whether it is planning a trip to Mozambique to bring scientists up on a 2,000-foot granite face to discover species discovery and create a new film on conservation, or rollerblading around the block in Minneapolis with my five year old nephew. I think my biggest challenge is to be both comfortable with what I am doing in the moment while at the same time seeking out the edges of comfort always with what I do. I'm interested in what happens at the margins of comfort and perceived security in the way we understand the word. That likely comes from my life as a climber, and it's something I'm grateful for every day. Have your visits there and the relationships you've developed changed you? Every time I go to Ethiopia, I am changed in some profound way. What I have learned is that I don't always know the impact of an trip until months or years later. But there are moments you know are changing you as they happen. I remember sitting in the high Amaro Mountains, listening to a woman tell me her life story - what it was like to be kidnapped at age 12, forced to marry at age 14, flee for her life, and then return to that community as a leader as an adult. That moment made me take notice of my own life right then; I could feel it happening. Then there are things that happen that you don't absorb immediately, but later come to bear profoundly in your life. I never knew that the children I saw going to school on my first trip to northern Ethiopia would be the ones to inspire me to work with imagine1day, a non-profit committed to the vision that all children in Ethiopia have access to quality education funded free of foreign aid by 2030. I didn't even know I recorded that memory until it came back years later. What's the one thing you'd like readers to take away from Coffee Story: Ethiopia? 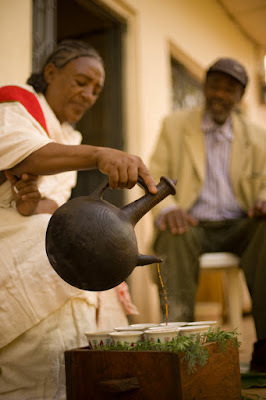 Coffee is the world's daily connection to Ethiopia. We can take that-- if we are coffee drinkers or not-- and make it a portal to a much greater understanding of Ethiopia with all of its varied realties and opportunities. During the speeches I give, I ask people to walk away and have "three-cup conversations." Coffee, in Ethiopia, is most often consumed in a three-cup process that leads to a deeper conversation with your family, friends, community, and strangers. Those conversations are often complex, and I think that willingness to dive in and have a complex conversation is a grand goal of the project. How can someone like me, someone who adores coffee, affect change for its producers? If you drink coffee, or see coffee being consumed, you can make a change with coffee. The single biggest thing you can do is to pay attention to quality and to let quality dictate how you spend your money. Go explore. Drink new coffees. Learn about the spectrum of tastes and flavors. Assuming you like this insanely flavorful and exciting way of drinking coffee then you will help increase the demand for high quality coffees. Those can make a huge economic difference to the growers as that demand ultimately goes back to them. Furthermore, and as importantly, I believe that if you attach cultural stories to coffee then you will be supporting those growers with honor as well as economics. That honor goes a long way, consciously, and unconsciously, toward an elevation of the people who are most vitally involved in the growing process. It's not about the poverty, it's about the possibility. Huge thanks to Majka for sending me a complimentary copy of her book to read! As always, all opinions expressed here are my own. Interested in owning a copy of Coffee Story: Ethiopia? It's your choice how you buy it, but if you purchase directly, $3 of every purchase is donated to innovative non-profits and you have the option of signed and inscribed copies. An Amazon purchase supports our sales there. Either way, it's up to you! What an awesome article. A lover of all things coffee, I like how this article reminds us to think of where our coffee comes from. Thanks, Christine! I'd definitely suggest getting the book if you can. I thought I knew a little something about coffee until I opened Majka's masterpiece. It's part encyclopedia, part photographic collage, part fun story, and many other things!